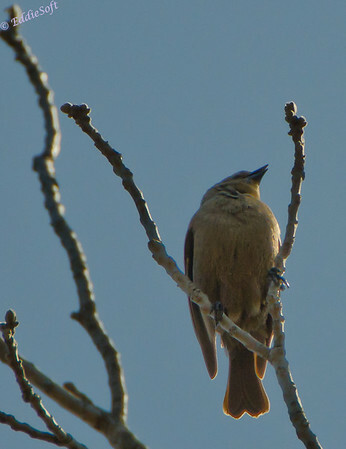 It’s a two-fer day for the blog and now that the pictures are processed, two more checks in the bird list. The first bird isn’t really new to me an in fact has frequented our feeders quite regularly during the warmer months. 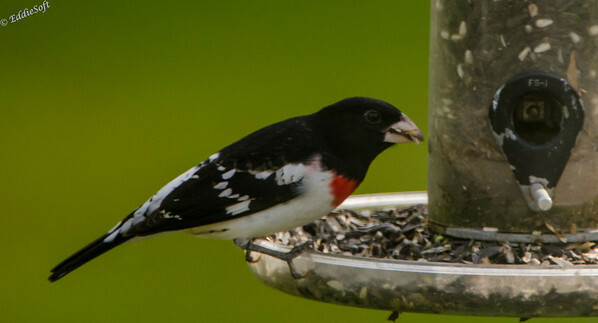 I didn’t really think much about it figuring it had already debuted on the web so imagine my surprise when I did a quick search on the blog and came up empty on the Rose-Breasted Grosbeak. 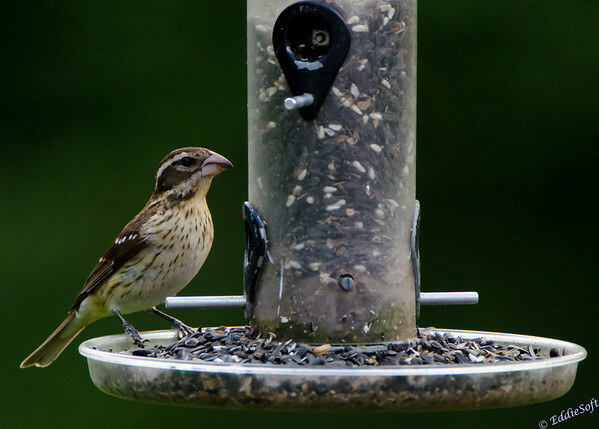 Hit the jump to see the female Grosbeak and our other featured bird. 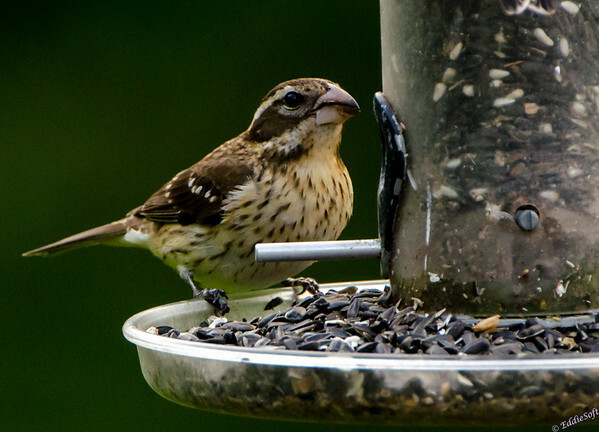 In stark contrast to the male, the female Grosbeaks are just plane boring and easily mistaken for the common sparrow. They tend to be a little stockier than those and that thick beak is usually the giveaway. Here is a female that was hanging out at our feeder as well. Like the male above, just chomping away at the abundant food source. They say that birds do not habituate to hand outs – hoping that is true, hate to think I’m causing an impact on their survival in the wild – not going to be around ALL the time – hehehe. So that is bird check number one. Next up is one of those birds heard more often than seen. I literally chased the sound of this bird for 20 minutes before I finally located the source. 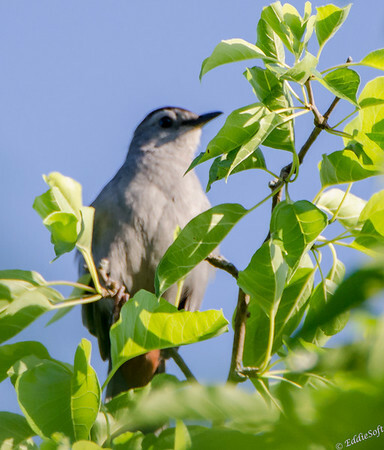 Sorry for the softness, but these Gray Catbirds tend to only hang out at the tops of the trees or in thickets which makes it hard to to find a clearing in the forest canopy to get a crisp shot. 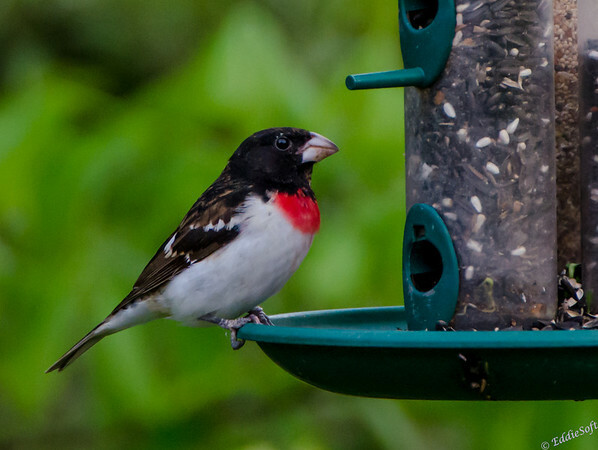 As noted by the Cornell site, these darn birds need to lay off the caffeine. Hopping there, sprinting over there, jumping up, jumping down – think this shot was taken in the only two seconds it stood still to take a rest. 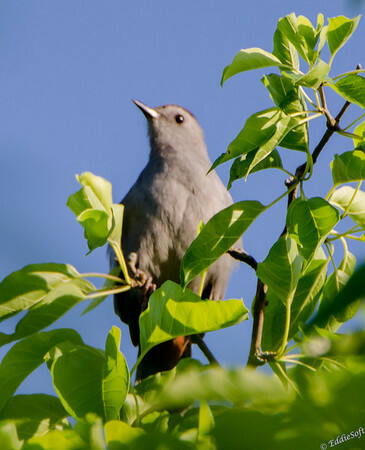 In stark contrast to the Grosbeak above, the Catbird females are indistinguishable from the males – they are both dominant gray with a darker black cap on the top. If you get a chance to see the underside of their tails you will see rusty colored feathering. You can just barely make that out in the shot above and below. 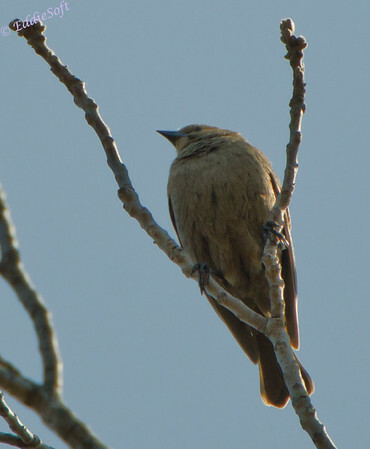 Like the Mockingbird which they are related to (as well as the Thrasher), I always thought these birds had a very distinctive song – like a loud screechy cat. What I didn’t know until being informed by my friends over at Wikipedia, they tend to steal the songs of other birds. We should call them Lady GaGray Catbirds (in defense of Madonna). At first I was not sure what the following bird was. 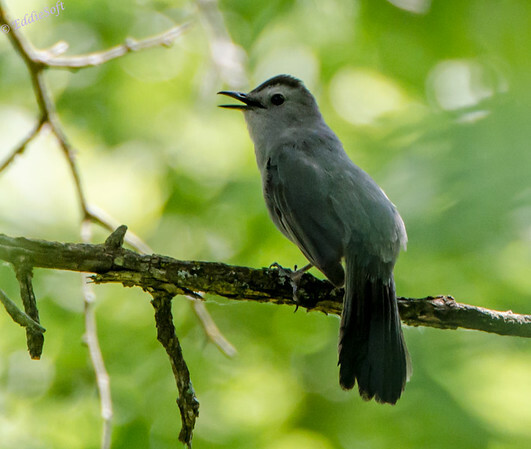 It kind of looked like a Gray Catbird, but it looked like it had a crest- somewhat similar to the Flycatchers. The tail angle was interesting as well and without the benefit of a look at the underside of the tail feathers there was some hesitation on the ID. That is until I was perusing the Cornell website and meandered through their description of the bird (always like to keep my peeps as informed as possible!). Almost instantly, my eyes were drawn to their stock shots – a PERFECT MATCH – pose and all (link here first one). It always makes it easier to have a direct reference as opposed to the shot below. The following shots were taken at the Wisconsin Dells – again, the song is what found it for me, but without seeing the crown or a better look at the beak it is hard to say exactly what it is – sure seems to have the Catbird characteristics and with the exception of the smaller bill (possibly due to angle) it looks pretty similar. That’s all I have for today’s post. Again, one of the larger set of images for Project Chekov but I say more is always better than less – well, that is what the AT&T spokesperson keeps telling me .. err. the kindergarteners. Until next time stay warm. Well, I’m not convinced that the last two shots are Gray Catbirds, but I can’t seem to get an identification off the birding sites. The color is brown rather than gray, the tail ends are different, and the top beaks (just visible in the last shot) are different, I think. But I can’t seem to find it online. Believe it or not, after I entered all the attributes a barn swallow came up as an option. Nope, it really did come up with a list that included the Barn Swallow. It appears that one of the best search tools for identifying birds nowadays is a Google Image search.